In recent years people on the high street have caught onto what farmers and shooters have known for years, Barbour really do make great jackets. Whilst the Barbour jackets being worn in our towns and cities might differ radically from what the traditional Barbour customer is wearing in the shooting field, they should be thanking the shooters, for it is the development that goes into designing the ultimate shooting jacket that filters down to the high street ranges in later years. And whilst the fashion side has been going well in recent years, Barbour have perhaps lost ground in the shooting field to newer names like Schoffel and Musto. However last season they made a come back with 3 great new jackets, and this year they’re come up with something that I think may be a bit special in the new Sporting Featherweight Climate. Due to have been launched at the now cancelled CLA gamefair, you can still get in early and get the jacket online, advisable given that demand already looks set to exceed supply come the start of the season. The first thing that stands out about it is the price. At £300 it may sound steep, but in comparison to other GORE-TEX® shooting jackets of this build and design quality, it’s actually incredibly good value (dare I say cheap even). The Featherweight Climate, as the name suggests is very light in total weight, which is important when the jacket is designed to be worn all day, because you don’t want the weight dragging you down after miles of walking. However warmth has not been sacrificed to cut down on weight, it still has a quilted fleece lining to keep you warm on even the coldest days, but by using durable yet low density material Barbour have managed to achieve the seemingly impossible, warm, lightweight and durable. The durability comes thanks to a GORE-TEX® Rip stop outer fabric, which as you would expect is fully waterproof and breathable. Many arguments are yet to be settled as to whether GORE-TEX® offers value for money with so many other good membranes now available. However it is worth noting that GORE-TEX® exceeds the British standard for waterproofing by a factor of 10! When you buy a generic membrane, you don’t know ‘how waterproof’ it really is. Something a bit different and innovative about this jacket is the front pockets. As well as the traditional bellow pockets for your cartridges, it has large secondary pockets behind, ideal for gloves and other bits and pieces. If like me you hate the hassle of undoing your coat every time you want to get to these other bit from inner pockets, you’ll appreciate why this might be the jacket for you. Barbour’s Shooting Jackets range this year again features the Sporting Ultimate 3 in 1 and the Featherweight Shooting Jacket, however I’m fairly confident it will be the Featherweight Climate that proves to be a real winner. I am the Clothing and Gunroom Manager. I have been working for Philip Morris and Son for over 30 years. Throughout my time here I have gained valuable and extensive knowledge surrounding all things to do with country clothing and field sports. When I'm not at work you can find me out in the field putting all of our latest shooting clothing and equipment to the test. 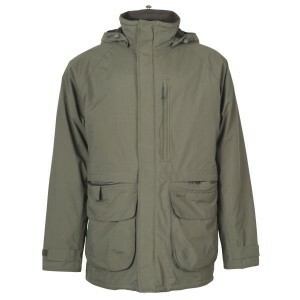 Barbour Feather weight Climate, Barbour Shooting Jacket, Barbour Sporting Featherweight Climate. Bookmark.